It is 10 minutes past midnite. Monday, 30th January just began. Two more days to go and the second month of the year, February, will come. It will be a special February this year since it will have 29 days which occurs every four years. There are three chess tournaments held yesterday as GiLoCatur aware of. A blitz event in Tambun, Ipoh. A state selection tourney in Kota Kinabalu. An Insofar chess tournament at DATCC, Kuala Lumpur. There were two chess tournaments took place in the eastern states - Terengganu and Kelantan, on Saturday. KC2012 or Kelantan Closed was held in Machang for two days on Friday, 27th and Saturday, 28th. A secondary school in Dungun hosted a one-day chess tournament for Terengganu school pupils. GiLoCatur was wrong to mention that the Insofar combined tournament is the first national-rated tournament of the year. 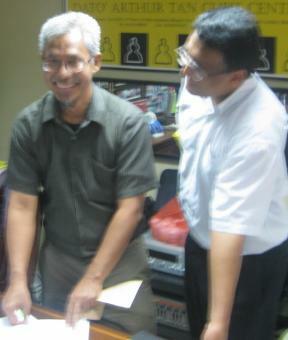 Actually, the tournament in Dungun called Aizek Back-2-School chess challenge will be the first one. Isn't this a good sign for Malaysian chess? Let's look at the number of participants. Limau Bali Blitz - ? In total, more than 500 participants took part in five chess events in the weekend. Two of them are national-rated as per promoted by the organizers. Rating is one of the motivation for many Malaysian chess players. Based on rating, they know whether they improve or otherwise. GiLoCatur strongly believes that it is time for the MCF or national rating to be improvised. The rating should have an ID like FIDE rating. The DOB or Date of Birth needs to be included and updated. It is important to ensure the correctness of the database like to have the Top 100 Malaysian Juniors or Top 10 Malaysian Under 12 or etc. One good factor for Malaysian chess progress is more and more chess tournaments are covered and published on the net. The pairings and results are published in chess-results.com. Thus, all the Malaysian chess enthusiasts are able to know who are the winners. GiLoCatur strongly believes that the Malaysian chess will keep progressing and improving. And chess tournaments will be held almost on every weekend. The big challenge is to attract more and more people to play chess. Let's take a look at the Insofar combined tourney results. Below are the Top 10 for both starting rank and Final Ranking. It is interesting to note that Abang Bro could not be among the Top 10 in the final ranking even though he is the top seed. 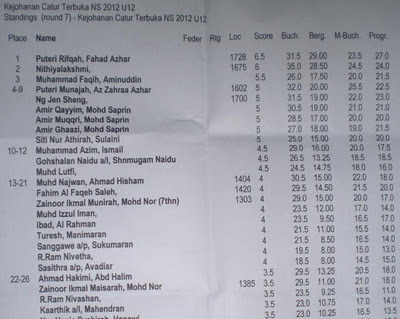 He lost only twice to Dr Zaidan and Sumant, the eventual champion. It is also interesting to note that two 1500-rated player won the final two slots. One of them is Jonathan Augustine, a player to watch for GiLoCatur. He has been participating in many local chess tournaments lately and performed quite well. He beat Camilia Johari and Abdul Haq in this tournament. If Jonathan maintains his well performance like this he may rise to the top and improves his rating. It is also interesting to note that no woman or girl player among the Top 10 Final Ranking. The absence of several top women players like the Azman Hisham sisters - WCM Nur Nabila & WFM Nur Najiha, the Puteri siblings - Rifqah & Munajjah, and WNMs - Alia, Li Ting, Nisa' and Mi Yen, just to name a few, weakens the women challenge. 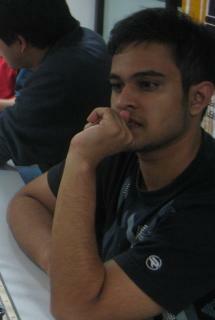 The champion, Sumant Subramaniam (below picture) came with his father and siblings to the tournament. His younger brother, Shreyes, performed quite well with 4 wins, 2 draws and 1 defeat scoring 5/7 points. Syabas and tahniah to Sumant. 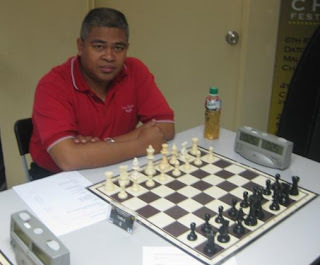 Bravo and salute to Mr Zaki Mat Yeop, an active chess organizer and chess player. Hopefully, he will keep organizing more and more chess tourneys. Kudos to Stonemaster, another active chess organizer, too for promoting and marketing well the event. GiLoCatur heard that there are nearly 130 pra-registered participants for today's INSOFAR Combined Tournament, believed to be the first national-rated event of the year. Actually, there are three tournaments - Rapid Open, Junior Scholarship and Open (non-junior) Scholarship, combined in a single event. That is a good news for Malaysian chess. Unfortunately, GiLoCatur and the kids can not participate. GiLoCatur would like to wish BEST OF LUCK to all who will participate. Play your best to improve your national rating. Or maybe to earn your first national rating. Please contact Mr Zaki Mat Yeop at 017.203.2051 for further related inquiry. To all Malaysian juniors chess players especially staying near JB! An age group chess tournament will be held for you. JB Chess Association & Southerncity Giant Hypermarket. per player to complete the game. Late entries and entries without payment will not be accepted. Entry fees are non refundable. To all Junior chess players in the Klang Valley! DARE to compete in the PERCAWI City Day Age Group chess competition? 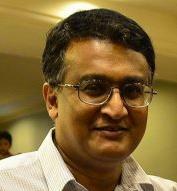 Check out below details sent to GiLoCatur by Candidate Master (CM) Collin Madhavan (below picture). Click here to download the entry form. There will be 5 cash prizes in each category, boys and girls. The top 15 boys and top 10 girls will each receive a medal and certificate. Do you know what is the name of below fruit? Have you ever eaten it? Actually, in Malay it is called limau bali. It is pomelo in English. Scientifically, it is known as Citrus grandis. During GiLoCatur's childhood, GiLoCatur used to eat this fruit because GiLoCatur's parents planted the fruit tree nearby the house. Do you know where to find limau bali? 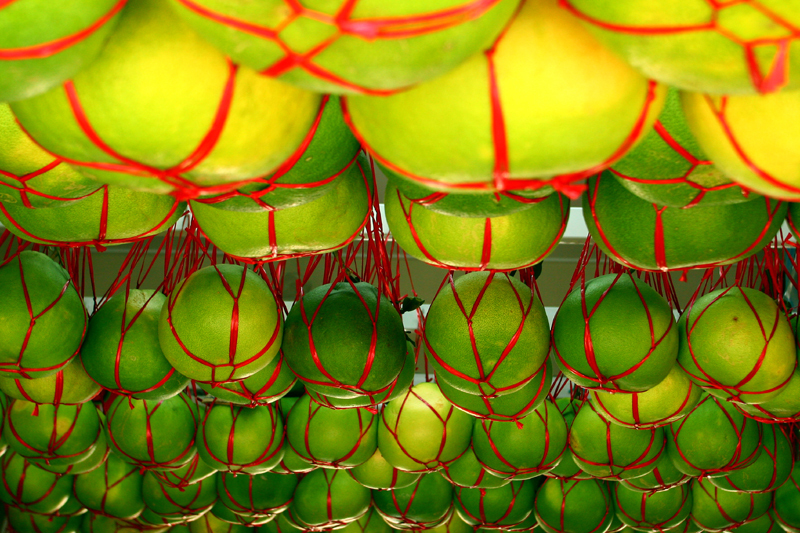 One of the popular spot to buy this fruit is Hentian Limau Bali located in Tambun near Ipoh. It is a good chance for the Malaysian chess community to go to the place because a blitz chess tourney will be held on Sunday, 29th January. The format of the tournament is 10-minute-per-player in a seven (7) SWISS rounds. The tournament is limited only for 50 participants and the champion will bring home one hundred Malaysian Ringgits. 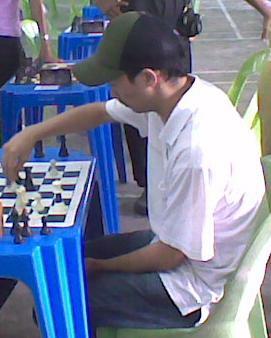 The tourney is organized by Persatuan Catur Daerah Kinta or Kinta District chess association. BRAVO AND KUDOS TO JOHAN JAMIL AND KINTA DISCTRICT CHESS ASSOCIATION (KDCA) FOR ORGANIZING THE BLITZ TOURNEY. CAN JOHAN & KDCA ORGANIZE ONE TOURNEY EVERY MONTH? To register, to get the registration form and for further enquiry please contact Johan either to his mobile or email. Ape lagi yeop, moh kite makan limo bali sambil nolak buah catur!!! Do You Love Your National or Traditional Costume? Do you know the lady in below photo who is in Kimono? GiLoCatur believes many of you know who the man is, right? 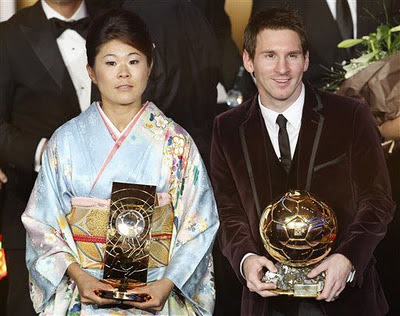 For those who do not know, the lady in kimono is Homare Sawa. Who is she? What award she won? Ms Sawa is the captain of the Japan's women football team. The award she won is FIFA Women's Player of The Year in a ceremony held in Zurich last night. She led her national football team to win the 2011 Women's World Cup. What impresses GiLoCatur is that, Ms Sawa loves and prouds her national or traditional costume. She would like the whole world to know about it. So, how about us? How about our children, the Malaysian young generation? Don't we should instill our children to love our traditional or national costume? 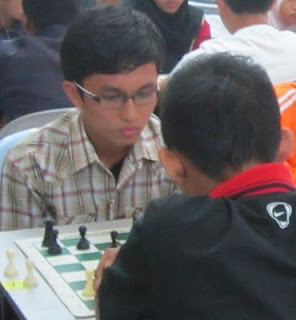 One of GiLoCatur's chess-related sweet memories in 2011 is the match between GiLoCatur and the top seed, Mohd Huzairi Hussin, in the 1st Kompleks 3C chess tournament held on 3rd December. The match was in the third round after both of us had won the previous two rounds. Being an "amateur" as per Stonemaster's players classification and having national rating of 1430, GiLoCatur played black against the humble UPSI chess player who is rated at 1574. 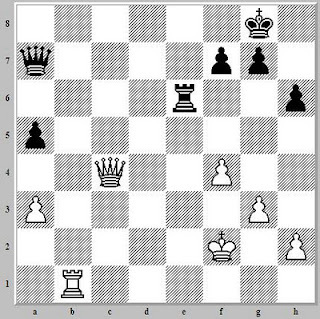 Black tried to attack white in the Queen + Rook endgame at the above position. GiLoCatur made the following moves ... Qa8+ 2.Kh3 Rc6 3.Qb5 Qc8+ 4.Kg2 Rc2+ after white moved his King to g2. GiLoCatur forgot on what row the white King was moved, either back to row 1 or forward to row 3. 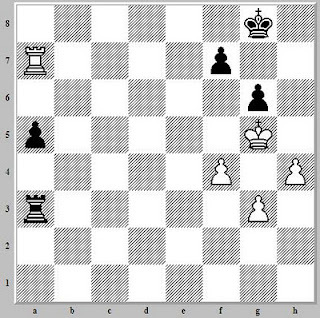 After several moves, the position ended up to the following. At this position, GiLoCatur had 33 seconds left while Huzairi had 48 seconds. And it was GiLoCatur's turn to move. Finally, GiLoCatur lost on time. Do you think that GiLoCatur could win from the above position? Yesterday, GiLoCatur went to Seremban Parade using the commuter. GiLoCatur brought along Fahim and Anis. It took us more than two hours for the commuter ride from Batu 3 station to Seremban. Both Anis and Fahim took part in the Negeri Sembilan Open in the age group category - U18 and U12 respectively. Do you want to know the Final Ranking after Round 7? The total players took part in this category is 46. Puteri Rifqah Fahada came out as the champion. She won six games and drew one. She scored 6.5/7 points. She was awarded prize money reward of three hundreds Malaysian Ringgits. Below is the Top 25 Final Ranking after Round 7. Fahim lost his final round when he played against Amir Muqqri Mohd Saprin. Therefore, he missed to be among the winners. 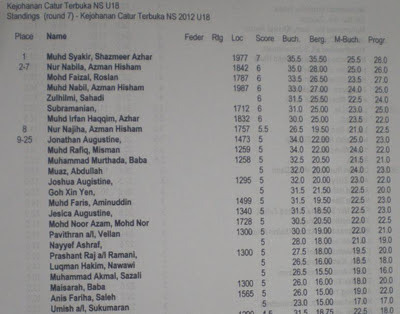 In U18 section, Rifqah's elder brother Syakir Shazmeer Azhar won all his seven rounds to become the champion. He beat other 125 participants in this category. He received the prize money award of four hundreds Malaysian Ringgits. Anis Fariha lost only two games so that she scored 5/7 points. She was placed 24th. It was a very tough competition. Today, the open category will be held. The champion will be rewarded ONE THOUSAND Malaysian Ringgits. A number of players who played in the age group yesterday will take part today. GiLoCatur was told that IM Mas and FM Nicholas Chan will be taking part. Besides the two of them Malaysian-based Filipino Ian Udani will also take part. All of them are among the top players (have MCF rating of 2200 and above) to beat in the local chess competition. Will one of them become the champion? Or will other player make an upset to win the N9 Open? is the deadline for all national-rated tournament organizers held between October and December 2011 to submit their relevant files to Mr Lim Tze Pin, the Malaysian rating officer. Click here for his announcement. GiLoCatur hopes they will do so because many Malaysian chess players who had participated in the rated tournaments can't wait to know their new national rating. As mentioned in Tse Pin's blog, the new rating list will be released on 15th January. GiLoCatur also hopes that the Malaysian chess community will not be in state of "keep asking when the national rating will be out" because it will be released on every 15th Day of every new quarter. Just not sure it is either 3-month or 4-month quarter. Today is the first day of the new year, 2012. 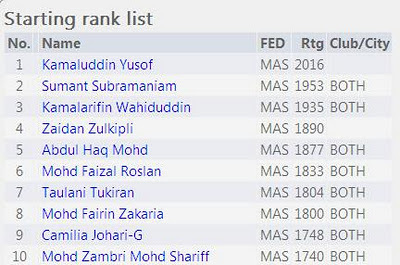 For some Malaysian chess players, surely they are happy because some of them get their FIDE ratings and other some of them gain rating including Anis Fariha and his elder brother, Fikri. Even though the rating gain is not that much BUT it is a good start to improve further in the new year. 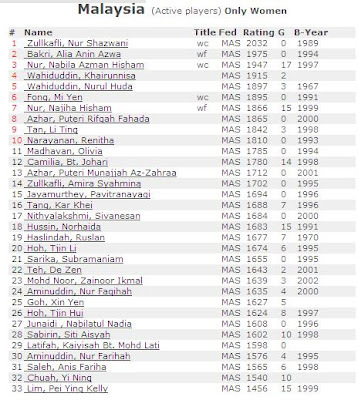 Let's check on the new Rating List for the Malaysian women (active only) published by FIDE in its website. As GiLoCatur observed, the number in the list has increased from 28 to 33. 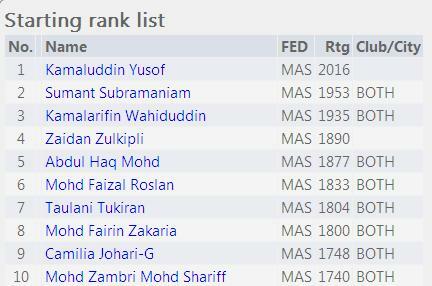 Four Malaysian girls just got their FIDE rating. Well done for their effort and determination. This is good for Malaysian chess especially in the women section. But the rating of our ladies in GiLoCatur's opinion is generally low. Malaysia does not have any women grand master (WGM), not even an International Master (IM / WIM). (GiLoCatur : inactive players not included). Malaysia has only TWO WFMs and THREE WCMs. How about if we compare with our neighbouring ASEAN countries. We are so far behind Vietnam. There are 85 active women players in the FIDE rating list. Vietnam has 4 WGMs and at least 10 WIMs. How about Philippines? Sorry, no data available in the FIDE website. Don't know why. Indonesia? Singapore? The list for both Indonesia and Singapore is about half of Malaysia. 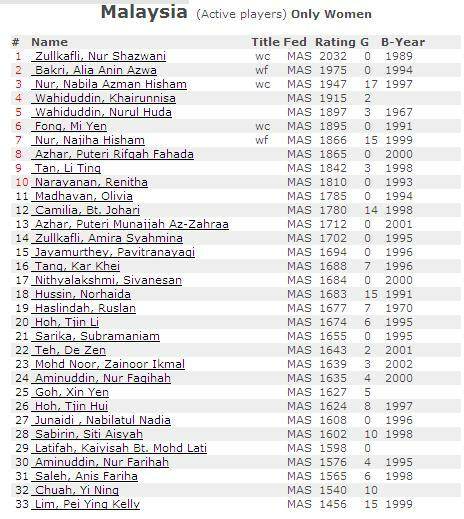 To be exact, Indonesia has 15 active women chess players who are FIDE-rated while Singapore has 14. But our top female chess player will only be at the 8th spot in the Indonesian list. Meaning, Indonesia has more higher-rated female players than us (Malaysia). 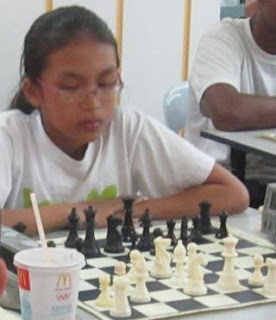 So, it is important to the Malaysian chess community to work towards improving the ratings of our female chess players. This feat will not be achieved if our female chess players do not participate in rated chess tournaments, RIGHT? How to make them play or participate in more rated tourneys? One answer is to have more local rated (FIDE, GiLoCatur means) chess tournaments. GiLoCatur hopes more and more Malaysian ladies and girls will get FIDE rating in 2012. And all the rated Malaysian ladies and girls will improve their rating as the highest as possible. Let's all the chess parents, chess authority (MCF), chess associations, chess coaches, chess clubs and ofcourse, chess players work hard and make it happen. This is the first entry in the year of 2012. 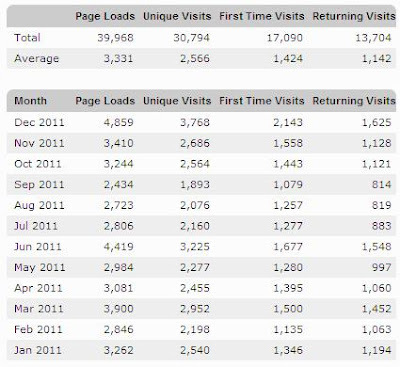 The entry is about the visits statistics of this blog in the year 2011. GiLoCatur uses three different counter services to keep track the number of visitors to this blog. They are widgeo, sitemeter and statcounter. Serious bloggers monitor and keep track the visits information and data to help them improve the content of their blogs. So, let's take a look at GiLoCatur's Blog visits statistics. From the above Sitemeter's Visits By Month chart and data, it is very obvious that the top month is December. June is next followed by March. 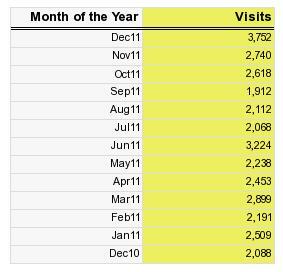 GiLoCatur's blog had more than 3,000 visits only twice - in December and in June. Below StatCounter's chart and data confirm and verify the visits pattern and trend. 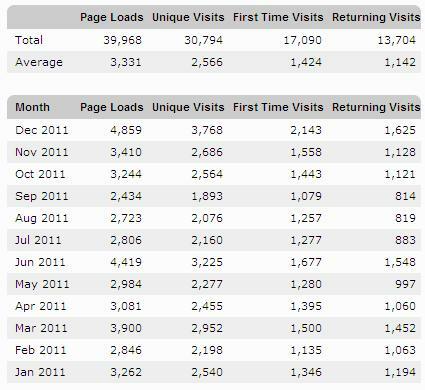 Why GiLoCatur's Blog received many visitors in December 2011; BUT not in December 2010? 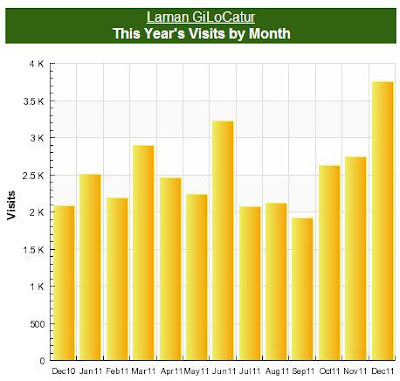 Why in June and March every year, the number of visitors are high? There are several chess tournaments held in December 2011 where GiLoCatur had covered or wrote about the majority of them. The Penang Open was held in the first week. Then the Sarawak Open in the second week followed by the 4th NJCC in the third week. In the fourth week, there was the 8th Singapore International Chess Festival. GiLoCatur wrote 20 and 38 entries each in November and December last year respectively. But ZERO and only 16 in the same months in 2010. GiLoCatur was in Mecca to perform the pilgrimage or Hajj in the whole month of November and first week of December in 2010. MSSM Chess Championship is normally held in June while NAG (the National Age Group) is in March. These two tournaments are the main attraction for the Malaysian chess followers and enthusiasts. All the Malaysian chess bloggers should take note of this fact. The coverage on such chess tournaments should be done as best as possible. Based on the statistics, the average visits to GiLoCatur's Blog is about 2,500 per month. The blog had more First Time visits than Returning visits. GiLoCatur would like to SAY THANK YOU very much to all the visitors and readers. Positive and constructive feedbacks are very welcome.